Lest you thought the last winter transfer window—in which a series of Chinese clubs proceeded to obliterate our understanding of and expectations for the international transfer market—was a fluke, here come Shanghai SIPG breaking records once again by dropping an unreal amount of money for Brazilian forward Hulk. The numbers here are staggering. To pry away the 29-year-old from his previous employer, Zenit of the Russian Premier League, Shanghai backed up a dump truck of cash reportedly carrying about €55 million. That fee breaks China’s record transfer outlay which was just set about four months ago when Jiangsu Suning bought Alex Teixeira from Shakhtar Donetsk for €50 million. At least Teixeira got to hold on to his transfer record longer than its previous holder; Jackson Martínez’s then-record €42 million move from Atlético Madrid to Guangzhou Evergrande didn’t last an entire week before the Teixeira one smashed it. 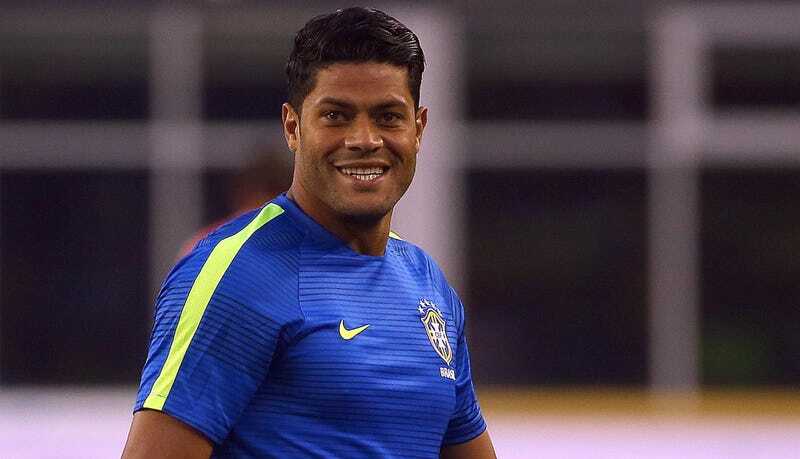 Shanghai will reportedly pay Hulk around £320,000 a week or £16.6m a year – more than Luis Suárez earns at Barcelona, though still a fair way behind Cristiano Ronaldo’s £52.6m annual deal at Real Madrid. That £16.6 million—or about €20 million—salary makes him the ninth-highest paid soccer player on the planet, according to the Guardian. Hulk’s Chinese adventure looks set to pay him a good bit more than his Japanese one, back when he was bombing in goals in Japan’s second division a decade ago. The new Europe-to-China-for-a-king’s-ransom industry remains fascinating for a bunch of reasons, and this transfer calls to mind a few of them. For one, the economics of paying for aging stars has completely changed. Clubs can afford to spend big either bringing in or retaining famous players, safe in the knowledge that there’s a very good chance a Chinese team might swoop in a year or two down the line and offer the club and the player terms neither can refuse. The club gets a fat check and trims the wage bill, the player gets an enormous new salary, and China gets another star. It’ll be interesting where guys like Dani Alves (now 33 and at Juventus) and Zlatan Ibrahimović (34 and at Manchester United) are playing a couple years from now. However, that this move today was for Hulk, a Brazilian, demonstrates that it’s still mainly only South American stars who’ve shown a willingness to trade Europe’s or South America’s leagues for China. Whether their European counterparts will be similarly amenable to the switch is an open question. In any case, not only has the Chinese Super League passed MLS as the hottest destination for formerly elite players looking for one more big payday outside Europe’s leagues, the Super League has also been much more ambitious and successful with its acquisition of legitimate talent at or near their primes. This trend appears here to stay. From a selfish fan’s point of view, though, the news is kind of sad. Hulk has been one of our favorites for a while now, with his pistoning legs capable of hypnotizing defenders and spectators alike as they fly with and around the ball, and his nuclear bomb detonator of a left foot slamming into balls and sending them roaring into the top corners of the goal; it’s disappointing that it now appears certain that he’ll spend the entirety of his (still really impressive) club career away from the brightest spotlights his talent deserves—and almost entirely because of monetary considerations outside of his control. AS Monaco Signs Radamel Falcao. Wait...What? Oh well. At least he’ll be making lots and lots of money.